Seventeen years ago, I was a third-year engineering student at Istanbul Technical University pursuing an internship in Belgium. On August 17, 1999, a powerful 7.6M earthquake struck near Istanbul, killing 20,000 people and injuring 40,000. Our student house was damaged and my roommates escaped with mild injuries -- a few cuts and bruises on the head and body and sprained ankles. All had to live outside for a week. Most said that I was lucky to be in Belgium instead of Istanbul during the earthquake, but some commented that I missed the harrowing experience. Three months later, a 7.2M earthquake hit Duzce, Turkey. This time I couldn't avoid the quake. The epicenter was 120 miles away yet Istanbul shook strongly. When the shockwaves reached Istanbul, I was watching TV in the living room. Only after ten seconds had elapsed did I realize that an earthquake struck (the undulating ceiling was a clue). Next, my roommates rushed to the living room, scanning others' eyes for next actions. Among the most scared, I could barely stand. What would have changed had we received an advance warning of five to 60 seconds? The answer is clear: prevent injuries and potentially save thousands of lives. Unlike most natural disasters, earthquakes (excluding tsunamis) do not harm people directly. Rather, structures and objects that we build cause most injuries and deaths. Most earthquake-related casualties result from collapsing walls, flying objects, unsecured furnishings, or people falling when seeking safety during the earthquake. Even a few seconds are enough to move away from the riskiest places (kitchens, bookshelves), and 20-30 seconds might be plenty to find a safe spot and help minors. Worldwide, earthquakes killed more people than all other types of disasters combined, claiming nearly 750,000 lives, and affecting two-billion others over the past 20 years. Costs exceeded over a trillion US dollars (source: Belgium-based Centre for Research on Epidemiology of Disasters (CRED)). If an advance warning before an earthquake could prevent injuries and save lives, why doesn't the US (and many other earthquake-prone countries) have a fully functioning earthquake early-warning service? Contrary to what people think, the lack of technology is not the problem, but rather, the traditional approach to build the system. The biggest obstacle in building an earthquake early-warning system is the exorbitant cost. For example, the Japanese Earthquake Early Warning System--the most advanced and fully functional system of its kind--cost $1 billion over 15 years. Expensive research-grade sensors and remote communication platforms mandate special shelters and regular maintenance, often in remote areas. This traditional approach leverages a limited number of very sensitive sensors (too costly to roll out a dense sensor network). Our company, Zizmos™ aims to disrupt this approach. The team developing the Quake-Catcher Network (QCN) at Stanford University founded Zizmos. The QCN project was the first to tackle the problem of replacing research-grade sensors in remote areas with internet-connected commercial-grade MEMS (Micro-electro-mechanical-sensors) accelerometers in buildings. This new paradigm has shown that an Internet-based system with low-cost sensors provides comparable results to traditional methods for earthquakes, particularly with magnitudes of four or larger--which matters to people the most. Zizmos' mission is to build a scalable seismic network, supporting millions of sensors in urban areas globally. A dense network leads to a more robust and faster earthquake early-warning system. The denser a network, the more casualties we prevent. Moreover, Zizmos can build this dense network globally without manufacturing a single sensor! In 2007, Apple revolutionized the mobile phone. You say iPhone, we say "Apple Seismometer." The mass market loved this device, reaching hundred of millions of users globally. Unwittingly perhaps, Apple also created a mass-market wireless seismic sensor, which included an accelerometer and compass capable of detecting ground shaking, a processor to interpret the ground motion, a GPS receiver to locate the phone's exact location, and Wi-Fi or cellular connectivity to transmit data to any platform. Today, these features are indispensable parts of billions of smartphones. Intrinsically, most smartphones are seismic sensors. To achieve our vision, we need you to join the Zizmos Seismic Network. Zizmos introduced the Zizmos eQuake™ app in the Google Play Store (Android phones) and Apple Store (iPhones). Zizmos eQuake is unique in that we deliver an earthquake early-warning service to your phone via crowdsourcing. How Does Zizmos Generate Earthquake Early Warnings? 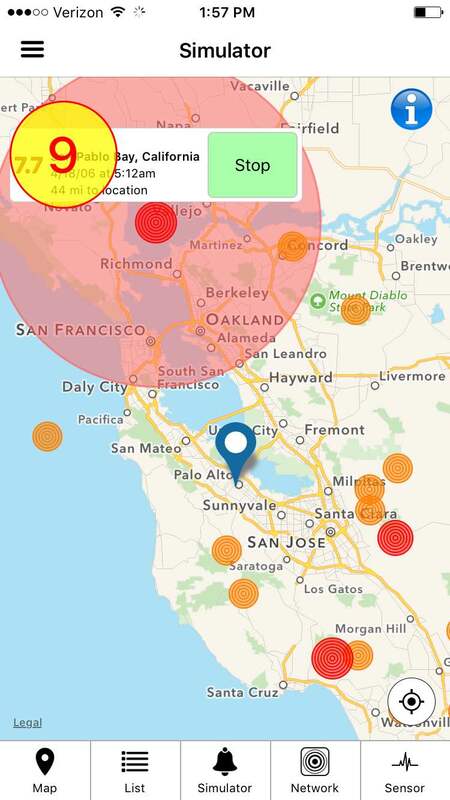 We leverage the phones of those nearest the earthquake epicenter to detect tremors at the onset, and transmit the alert to you over the Internet instantly before the earthquake shockwaves reach you. This may give you a few seconds up to as much as one minute advance notice depending on the distance between you and the first few phones that catch the earthquake. Implicitly, this requires Zizmos to have forewarning phones between you and the earthquake epicenter. If you're at--or very near the epicenter--your phone serves as a forewarning phone, helping to help save other people's lives. Those at the epicenter may not receive any advance alert, but rather, serve as a seismic sensor. Next time, the phones of others around the epicenter of another earthquake will contribute to alert you. It is important to understand the social contract among the supporters who want to contribute to the Zizmos Seismic Network. In order for you to receive an alert, people in other locations also need to join the network. The same applies to you--others will get alerts because you joined the network. It is both altruistic and symbiotic. To make this work and to continually improve our detection algorithms, we need volunteers to download our Zizmos eQuake app to their iPhones or Android smartphones. You can simulate historical quakes near you, and play with the seismometer native to your phone. The more citizens who join, the faster and more reliable the system will be. If and when the time comes, your participation can help save your life and others as well. 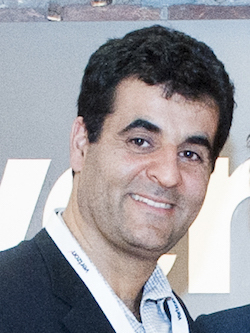 Zizmos is a 2015 Powerful Answers Award $1,000,000 Winner and is participating in the Powerful Answers Accelerator program at BootUp Academy. This program is designed to strategically accelerate companies' growth through intensive workshops and knowledge exchange sessions that provide best practices in business planning, product development, UX/UI design, global go-to-market strategies, communications, financing and growth hacking.